The basket on the helicoptor does a number on these heli-ski packs, because the holes were in about the same place, we patterned a patch that would cover the holes, sewed it into existing seams and applied the companies logo for a uniform, professional fleet. 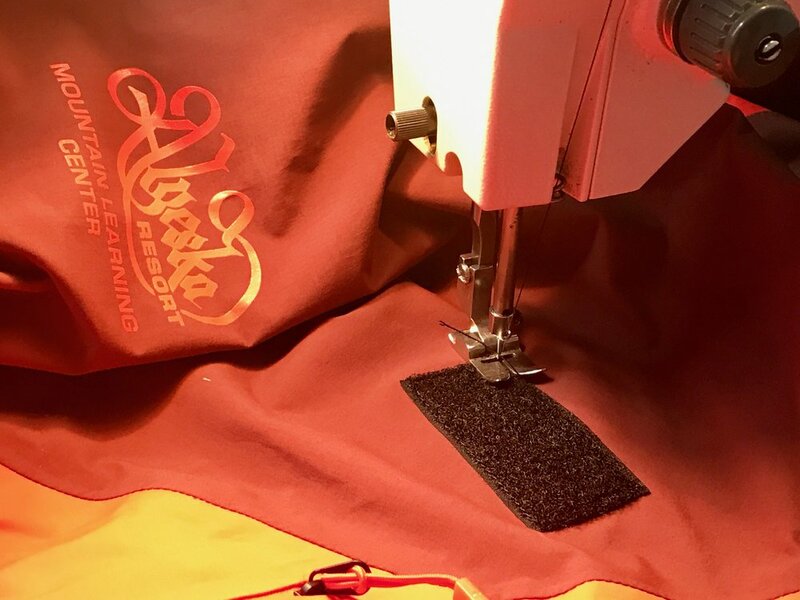 Velcro loop for name tags applied to Alyeska Resort uniforms. We have over two decades of experience in the professional outdoor industry, and understand the needs of outfitters, guides and organizations. Our repair services allow you to get the most from your existing gear, while maintaining professional appearance and functionality. We can seam tape your embroidered logos, provide heat transfer logos for uniforms, and apply velcro for name tags. We work with our commercial clients to provide repairs during your off season, and to meet your operational needs. Punching holes in brand new Gore-Tex®! More velcro loop for the Mountain learning center. After sewing on the velcro, we seam taped the inside to restore waterproofness for those rainy day lessons. Our Clients include Denali concession permit holders, independent mountain guides, fishing guides, resorts and startup outdoor organizations hoping to get the most out of expensive gear. We strive to fix your commercial fleet in a way that provides effective repairs that enhance your professional brand. Contact us to discuss your gear repair needs.